Preheat oven to 350°F. Lightly coat a 9" springform pan or glass pie pan with cooking spray. Combine crumbs and butter in a bowl and press into pan. Bake 10 minutes. 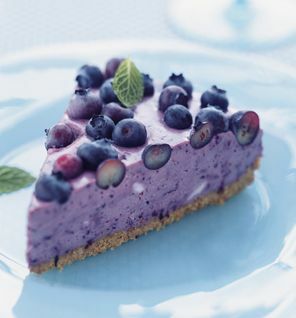 Puree 1 1/2 cups blueberries; mix with lemon juice in a microwavable bowl. Sprinkle gelatin on top and let stand 10 minutes. Microwave on medium 10 seconds to dissolve gelatin, then beat with an electric mixer or food processor at medium speed. Beat in cream cheeses and milk. Pour mixture over baked crust and chill until set. Garnish with mint and remaining blueberries.